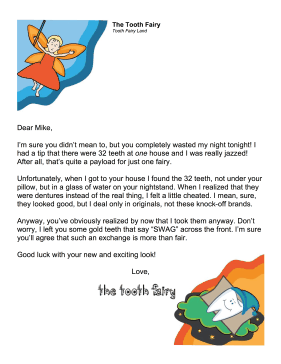 This joke letter is great for any older person who uses dentures and has a sense of humor. I'm sure you didn't mean to, but you completely wasted my night tonight! I had a tip that there were 32 teeth at one house and I was really jazzed! After all, that's quite a payload for just one fairy. Unfortunately, when I got to your house I found the 32 teeth, not under your pillow, but in a glass of water on your nightstand. When I realized that they were dentures instead of the real thing, I felt a little cheated. I mean, sure, they looked good, but I deal only in originals, not these knock-off brands. Anyway, you've obviously realized by now that I took them anyway. Don't worry, I left you some gold teeth that say "SWAG" across the front. I'm sure you'll agree that such an exchange is more than fair. Good luck with your new and exciting look!